In Apple's new interview with Stacy Spikes and Hamet Watt -- the pair of entrepreneurs who founded MoviePass seven years ago -- the conversation eventually focuses on where the idea for MoviePass emerged. According to Spikes, the kernel of the idea that would become MoviePass originated from art-house theaters in New York City that let customers see unlimited movies for a flat donation fee. He tried to install a similar model for his own Urbanworld Film Festival in the late 1990s, but admitted it was "too early," and that iPhones, apps, and the advances in development that emerged from this technology were all needed to address the technical roadblocks of such a service. "The idea was almost too early," says Spikes. "We didn't have iPhones and apps to figure out payment and interfacing. If it weren't for that development, MoviePass would never have happened." MoviePass works through the use of both the iPhone app and a paired debit card that is sent to subscribers through the mail after they sign up. If you want to see a movie, you travel to your local theater (MoviePass is supported at over 90 percent of theaters nationwide), select a 2D showtime, "check in," and at that time MoviePass transfers the exact cost of the showing to your MoviePass card. Then you can buy a ticket at the box office or a kiosk like any normal ticket purchase. Although the service is growing, many reports in the months following its August price drop have questioned how long the company can keep up the $9.95/month subscription fee (currently $7.95/month paid annually), as well as its public conflict with theater chain AMC. What MoviePass lacks in profit it hopes to make up for in accrued user data, selling a majority stake of itself to data company Helios and Matheson Analytics, which sees "big potential in the type of information it can glean from MoviePass members," with "no plans to sell user data to outside parties." As of January 2018, MoviePass had 1.5 million subscribers. According to CEO Mitch Lowe, MoviePass will hit three million subscribers by the end of April, and turn a profit once four million subscribers sign up for the service. MoviePass updated its iOS app [Direct Link] to support the iPhone X this month, providing a revamped user interface with more emphasis on images from popular films, better navigation, and an updated screen for the check in process. 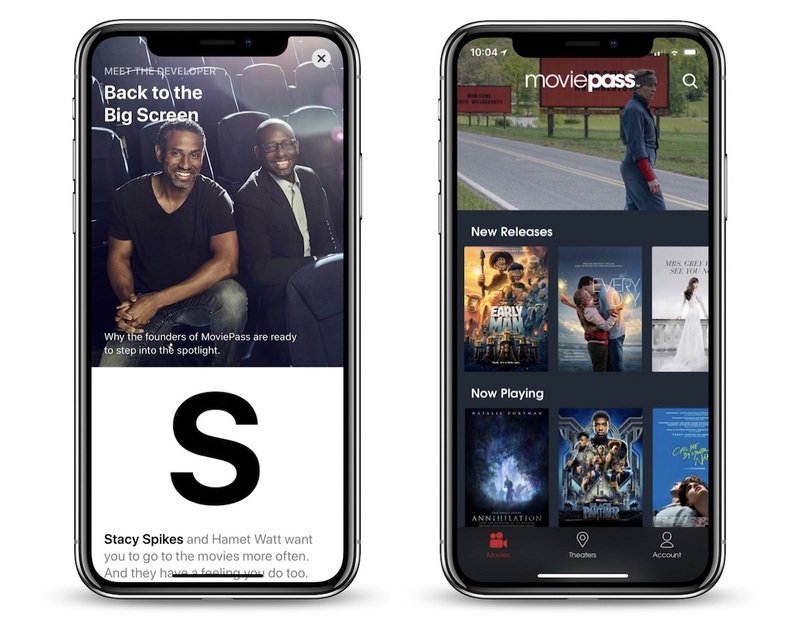 If you want to read the full interview with the creators of MoviePass, you can find the discussion with Stacy Spikes and Hamet Watt at the top of the Today tab on the iOS 11 App Store on iPhone or iPad. I love my MoviePass, I’ve had it since the $80/yr option last year. I’ve been to the movies more than ever, and I’ll buy concessions now. I’ve never had a problem with it, and I always recommend them to friends. Hopefully they’ll get a family plan going eventually. If for some reason MoviePass goes under, I’ll just go back to RedBox. I’ll change my habits before I go back to paying $12/ticket. Love MoviePass. I’ve seen more movies in two months than I have the past five years combined. I’m seeing movies I normally wouldn’t go out of my way to go and see. I recommend the service to everyone. As a developer forced to abide by Apple's rules, I'm incredibly confused as to how this company is allowed to bypass the typical Apple subscription rules, and not pay a commission to Apple. The user is forced to enter their credit card info *DIRECTLY INTO THE APP*, which completely bypasses the typical iTunes App Store subscription flow. It's the only app I've ever seen of its kind in this sense. Can anyone explain how this is possible? I used my MoviePass for the first time this Monday. Painless. 1) Open MoviePass and "Check into your movie"
2) Open the Theater App find your movie and choose your seat. 3) Pay with your MoviePass account. No theater around me will touch this app. I've mentioned it several times to people I know in the industry and they flat-out will not use it. The theatre has nothing to do with the app. They don't need to have any agreement with Movie Pass for you to be able to use Movie Pass to see a movie there. Movie Pass merely provides you with a debit card to purchase a ticket, as long as the theatre is listed in the app and you have checked in on the app for the movie you want to see. There is NO REQUIREMENT for the movie theatre to "accept" Movie Pass. Since this scheme doesn't make any money- the monetizing comes from deep data tracking analysis of its customers. Where you were, what date, at what time, what movie. Beyond creepy. Your privacy is extremely valuable. That's why creepy companies like this (and Google) go to extreme lengths the take it away from you. Yikes. It’s a damn movie app. What are you really afraid of? Do you realize how many companies have your information and can see what you’ve ordered and where you live etc. Give me a break. So glad I’m not paranoid. I LOVE MOVIEPASS. I see a movie at the theater every week and this has already saved me a couple hundred dollars since I signed up in October. You mean people in the movie theater industry won’t accept it? As I understand it, the moviepass card is just a normal debit card, so it’s not up to theaters whether or not to accept it, it’s up to moviepass whether or not to accept the theater. OIC. I thought you were talking about the pass itself. I bought the yearly pass so I wouldn't know about what you are saying then. Year pass or month pass doesn’t matter. For any subscription made through an iOS app, a cut is usually required by Apple. But yeah I’m not sure why this is an exception. I’ve been using the crud out of my moviepass. Watching so many more movies now. Most worthwhile subscription I have next to Netflix. I've just signed up and it makes going to the movies feel so much better not worrying if you are going to pay a lot and hate the film you just viewed. Just Feels like the future, the app for iOS has just been updated and is smooth. I'm just worried if I have a big family if I can afford to get them all a moviepass. For just 2 people it is a no brainer. Definitely worth the monthly $. Before when I would see a movie was out I would wait and see what the reviewers would say about it. I don't want to go see a movie and feel cheated of my time and money. With MoviePass I am going to see a lot more movies and if they are not the best who cares! Worst customer service I have ever experienced. Cannot get through on the phone and no action except acknowledging receipt of complaint for online submission. I have had the card for two months and not able to use it because of the wrong card number showing up in the app for some reason. No one from MoviePass will help. Canceling means I will not get a full refund so I keep trying to get through. I think one of the problems is that since they have lowered the price, they have signed on sooooo many more people and they just don't have the staffing to take care of issues. They need to get on the ball and hire more and should have expected the increase in signups as well as issues.